Best Toy Cameras For Kids - Are They Really Any Good? Toy cameras for kids come in as many flavors and colors as candy in a candy store. The million dollar question is will your child really get any benefits from receiving one? First you should realize that toy cameras are really best purchased when you have a specific age in mind for your young photographer. Just for kicks, I did a detailed search on Amazon for toy cameras for different age groups. I calculated average prices, and the top three results gave these age ranges. and price ranges. 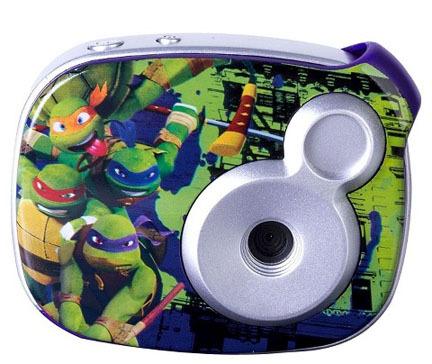 Some kid's cameras are based on popular celebrities, cartoon characters, action figures or movies. Some are intended to actually spark an interest in digital photography for young children, and yes, you can still get play-cameras that aren't cameras at all. The key is to get the right mix of fun and photography that appeals to the person who will be using it. For the kids who love transformers you can convert a digital camera into an action hero. Models like this one are likely be played with more as a toy and less as a camera. I really don't want to take all of the fun out of it, but you may want to take just a second to figure out why you're interested in play cameras. 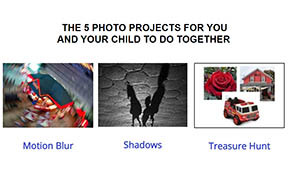 Are you buying a gift to spark a child's interest in photography? Perhaps it is that you just want to get a fun toy that will lead to lots of imaginative playtime. It's a great time to be looking because there is a range of options, starting from pure, make-believe choices through dedicated cameras with advanced settings, and everything in between. DSLRs are not toy cameras. They're too big for 9 yr olds. 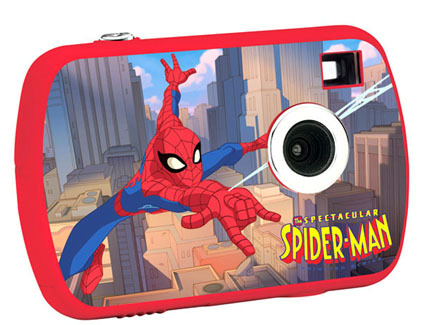 Important tip on choosing the right toy camera for your child: Make it comfortable for them to hold based on the size of their hands. Consumer Reports had 30 young photographers test some kid cameras. Although this is just a teaser video for Consumer Reports, it will give you some ideas on how kids may benefit from using them. The two biggest takeaways you should remember about kids and photography. Kids don't care about the quality of the image. Young children don't need to understand shutter speed and aperture controls. Let's be realistic, these cameras aren't designed or made to take the highest quality photographs. They're made for kids to have fun, learn a few things, and withstand bumps and drops that can happen when handled by young, inexperienced hands. You can do two things to improve picture quality. Get in the brightest areas possible. This will give you higher shutter speeds and sharper images. 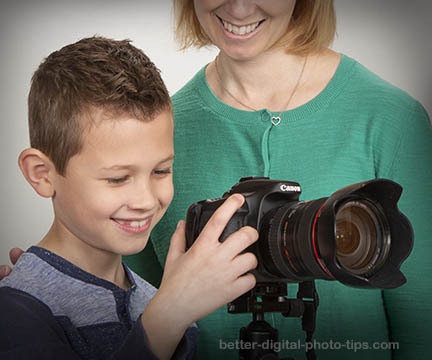 Teach young photographers how to hold the camera steady. You can tell them to "act like a statue when they squeeze the shutter button gently. You might be wondering what does the toy camera effect mean? It's the look that you might get when you use a camera with a very cheap lens. It's the effect that has quite a bit of blurriness toward the outside areas of the photo like the example below. The best way to get this toy camera effect is by using a specialized lens. 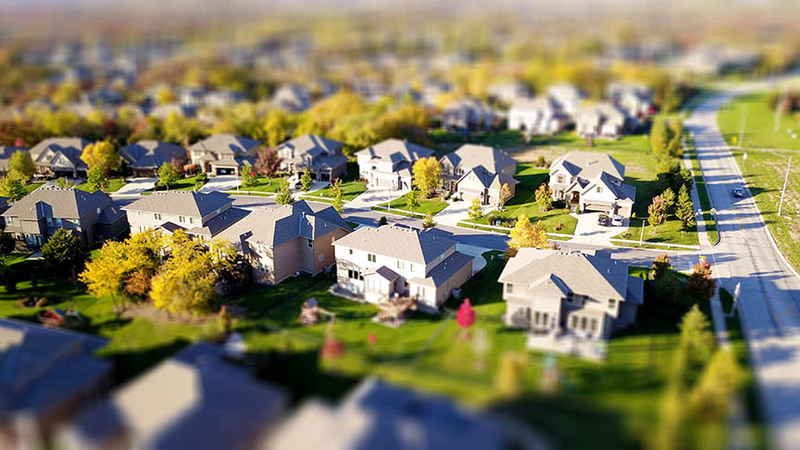 You can either use a profession tilt-shift lens or a much cheaper option is a Lensbaby. There are so many places to buy toys and cameras-too many to possibly cover in less than a 20-page book. One piece of advice: when you narrow down to the type of camera you may want, visit a review site. Try to avoid the online marketers who just try to steer you toward one specific camera they like. Like me, they sometimes may be getting compensated for referring customers to them, but they give their own personal bias toward a camera that fits their specific needs. It's often more valuable to read as many customer reviews as you can. Some retailers are better than others. You can visit retailers like Best Buy, ToysRUs, Target, or WalMart and get some opinions from customers who have purchased cameras for kids. 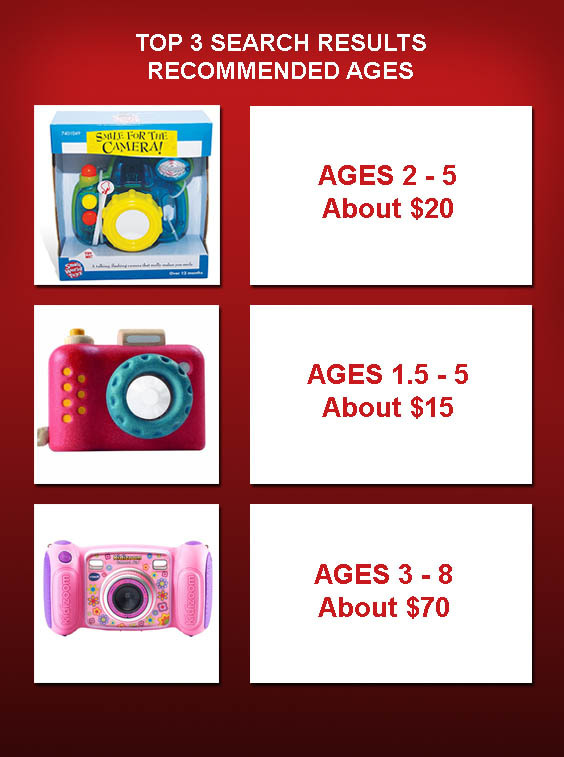 The dedicated online camera retailers like Adorama, B+H Photo Video, Samy's, or Ritz Cameras, don't offer a significant selection of digital cameras for kids. Wherever you decide to buy, Amazon is the king of places to read the reviews on children's cameras. Go ahead, just do a search for "toy cameras" and see how many choices come up. The total number of reviews written by consumers is astounding, so you have a better chance of getting some good feedback on a product. These are toys that DON'T take photos. You get these if you're looking to have your child play entertained without engaging in any picture taking activities with the exception of pressing a shutter button. 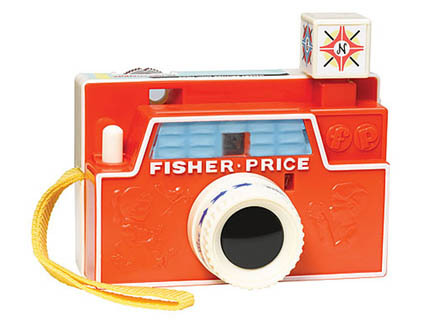 Just like the one I used to play with when I was young, this Fisher-Price play camera doesn't take photos. You look through the viewfinder and each snap of the shutter shows a new picture and tells a story. New stories are told by inserting new disks. 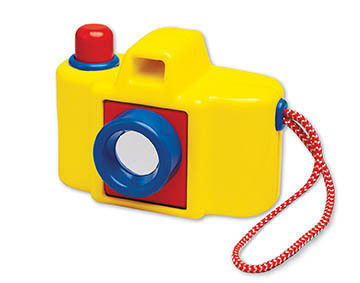 This might be appropriate as an intro camera to a very young child, to see if he or she might have an actual interest in taking pictures in the future. 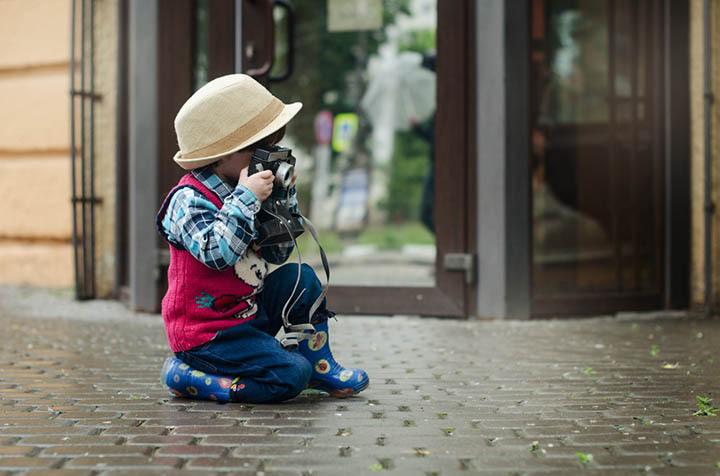 We can use digital photography as a great learning tool to spark a child's curiosity, improve visual and communication skills and build confidence in expressing themselves. You can find cameras for 3 year olds, toy cameras for toddlers, and several that are really just for imagination and not taking any photos at all. You, the adult, are the bridge between the child and their camera and enhancing their great experience with it. Be supportive and not critical of the quality of the photos they take. You will enhance the enjoyment of your child and her toy camera more than the actual camera itself. Participate WITH your child and the results can be magical. Shoot more photos. Shoot better photos. 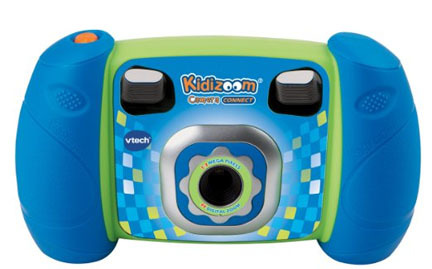 The V-Tech KidZoom model gets high marks from buyers and was reviewed more than any other model. Recommended for 18 - 36 month olds. About $11. 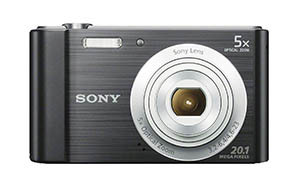 The biggest appeal of this camera is its bright colors and large shutter button. Theme based models like this one will appeal to kids who love a particular cartoon or superhero. Both of my boys were Ninja turtle fans.